I realized I never did an entry on coffee before! 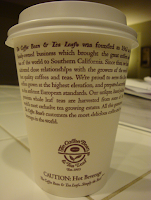 I enjoy the smell of coffee, it soothes and awakens me. I can survive without drinking coffee for months unlike other people, but this doesn't mean I despise the drink. Ever since I can remember, I always saw my dad drink coffee, day or night. Somehow this might have caused me to rebel against drinking it regularly? In Las Vegas there's many coffee shops. I always go to major chain coffee shops instead of small businesses. I need to change that! I guess I had a bad experience going to an unknown coffee shop once, it was obvious this place was imitating Starbucks. Once I venture out more and find a nice local business I'll post an entry about it! 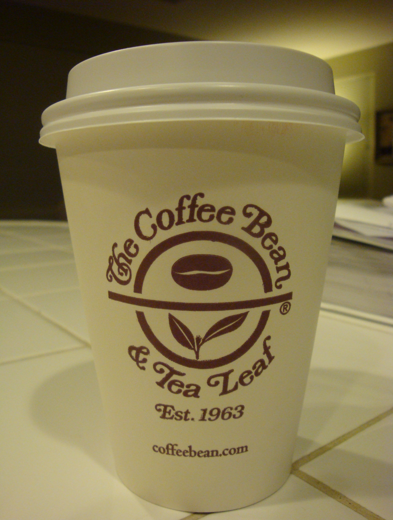 A coffee shop that I'm fond of is The Coffee Bean & Tea Leaf across from UNLV. I like it for its location, discounts offered to UNLV students (I'm an alumni though :-p), enough tables to merge for a study group, and my drinks are always made the way I like it! 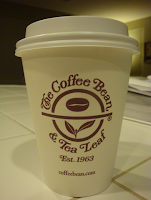 I like ordering the Hazelnut coffee, if you prefer subtle flavored coffee, try this drink.